I reviewed a disc of chamber works by Paul Hindemith back in 2013 (Blue Griffin BGR277) and took time in the piece to focus on the composer's fading popularity but seemingly ever-solid reputation. I won't get deeply into the reasons for this paradox, but I'll simply say that Hindemith's music is usually very noble and straightforward, free of gimmicks and excesses, but very often unsmiling and serious. In the piano sonatas here, there are of course moments of humor, playfulness and great color, but they are hardly predominant. Moreover, the music does little to attract attention to itself: there are no rhythmically powerful, relentlessly driving movements with the drama and swagger of the Prokofiev Seventh Precipitato, nor are there any catchy soaring lyrical themes like several in the same composer's War Sonatas (#6, 7 & 8) or in the Rachmaninov Second Sonata or even in some of Scriabin's sonatas. Thus, the three Hindemith piano sonatas, all dating to 1936 and all divulging masterly craftsmanship, come across as high art alright, but stand as works that are relatively modest, more introverted than extroverted, emotionally more tepid than warm, and more straitlaced than flashy. In the end though, these sonatas and the Suite "1922" are certainly rewarding compositions to the listener willing to give them a chance. The three sonatas have had champions, including Glenn Gould (Sony SMK52670) from yesteryear and Markus Becker (Hyperion CDA67977) in more recent times. Now we have these performances by American pianist David Korevaar (b. 1962). Korevaar has a considerable and varied discography that takes in works by J.S. Bach, Beethoven, Brahms, Liszt, Ravel, and many contemporary composers. As a member of the Boulder Piano Quartet he has performed and recorded much chamber music, as well. I haven't heard Becker but have familiarity with Gould and I can say that Korevaar compares very favorably with him. In fact, if you owned only this MSR disc of the sonatas, you would probably need no other. Korevaar brilliantly captures the melancholic stateliness that launches the First Sonata in a fairly brisk but well argued tempo. He remains alert to the changing moods, pointing up the sense of unrest in the second movement funeral march with deftly accented chords and weighty tone in the bass regions. He imparts a crispness and muscularity to capture the quirky nervosity and agitation in the ensuing panel. His phrasing here and in the remaining movements is always sensitive and intelligent. The finale comes across as triumphant in Korevaar's hands, but he deftly points up a sense of conflict as well. Korevaar delivers an equally incisive account of the smaller-scaled Second Sonata. Notice his first movement's power and drive, and the humor and charm he draws out from the following panel. The finale is appropriately melancholy in the first part and mostly upbeat in the rondo section that ensues. In sum, Korevaar captures just about the maximum expressive yield in this short but deftly conceived sonata. His Third Sonata is also totally convincing: try his breathless account of the second movement, with its wide range of dynamics and digital clarity in the racing tempos. He nicely contrasts the weightier angst-laced march in the ensuing movement with lighter and more elegant music in the upper register. His finale shortchanges no part of this challenging fugal music in bringing it to life with utter effervescence and subtlety. 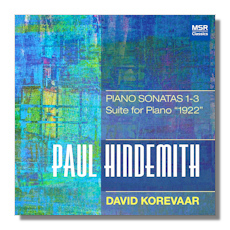 Suite "1922" is a set of five pieces that show Hindemith in a more unbuttoned mood. The Marsch that leads off is quite cleverly witty, almost sounding like a drunken takeoff on a Prokofiev march. Shimmy is humorously menacing in its sort of faux eroticism in the first half, and then it becomes increasingly agitated but in a kind of hallucinatory way, leading to what might be described as mad scene with a healthy measure of sonic mayhem. Nachtstück is a dark piece whose singing quality seems occasionally sabotaged by disruptive elements. Boston is a slow waltz that often doesn't sound like a waltz, but when it does it has a somewhat fanatical or frenzied character. Ragtime also has an over-the-top quality in its madcap demeanor and nervous drive, but its gruff humor is priceless. I can't help but think that Hindemith is somewhat out of character here, though admittedly he wrote some other music like this early his career and there's no denying this stuff has appeal in its brashness and colorful manner. In any event, Korevaar makes about the best case imaginable for these pieces, in a sense achieving the logically impossible: he seems to make the music sound better than it is! Excellent sound by MDR and insightful notes by Korevaar. Strongly recommended, especially to those who are aware that there's more to 20th-century piano music than Prokofiev and Rachmaninov.